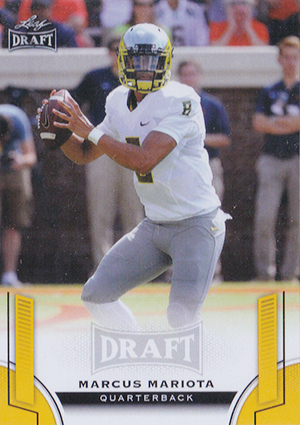 2015 Leaf Draft Football is a set aimed at the retail market. The checklist is straightforward in highlighting many of the key players slated to be rookies in 2015. The base set has 88 cards. 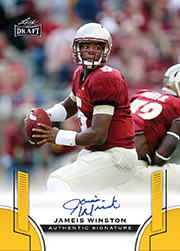 This includes five cards of Heisman winner Marcus Mariota and four for Jameis Winston. Base cards come with Gold parallels. The list of Autographs is even bigger. There are nearly 160 signed cards in the set. These also have Gold parallels, which are limited to 150 copies each or less. 2015 Leaf Draft Football Autographs are not inserted in packs. Rather they're packaged separately in blaster boxes in top loaders. 2015 Leaf Draft Football has two different configurations. The first has 20 packs (five cards per pack) plus a pair of signed cards. The second type of box has 30 packs and four autographs. 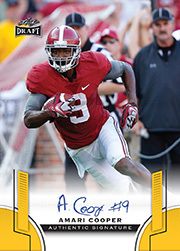 AMARI COOPER 2015 LEAF DRAFT ROOKIE CARD #88! ALABAMA CRIMSON TIDE! RAIDERS!! 158 cards. SP = Short Print, SSP = Super Short Print, MSP = Mega Short Print (rarest). You know what you’re getting when you buy these boxes…and I’m not sure why I bought a blaster of this over the weekend…maybe due to the dry spell is affordable retail releases? I ended up with 2 autographs from guys not expected to do much…Xavier Cooper and (the other one escapes me at the moment)…and the cards are pretty lackluster. I think Leaf Draft preys on suckers like me, desperate to fill the void until the 2015 licensed stuff starts to come out in June. Save your money. Agree with Josh. I was just wandering around this weekend and grabbed a box. Very lackluster. 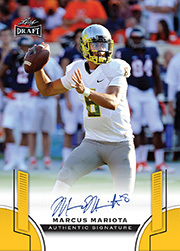 Two obscure autograph cards and absolutes piles of Winston and Mariota in five different designs. I gather the price is right…wait until June. same thing. Got sucked into the “4 autographs in every box” thing. Nothing special. Handful of Mariota and Winston. Will be overtaken once the regular card companies do their thing. Very boring card design but for $29.99 to get 4 Autos in a box worth a chance to pull one of the top guys if your just looking for something to open until the better stuff comes out.